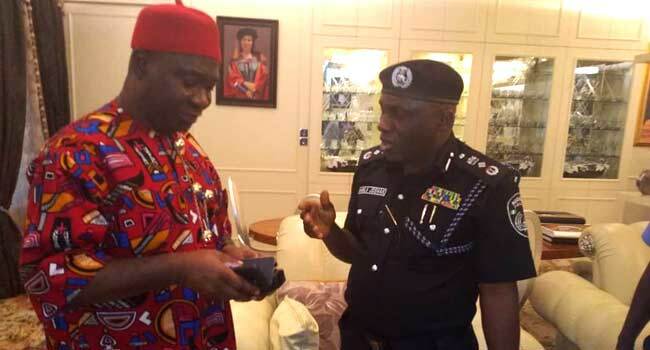 Deputy Senate President, Ike Ekweremadu, with Deputy Inspector General of Police (Operations), Mr Joshak Habila, at his residence in Abuja on November 6, 2018. The police say the attack on the residence of Deputy Senate President, Senator Ike Ekweremadu, is a case of burglary. Force Public Relations Officer, Jimoh Moshood, disclosed this in a statement on Tuesday, hours after the lawmaker raised an alarm of assassination attempt on his life and that of his family. “Preliminary investigation carried out so far did not reveal assassination attempt on the life of the Deputy Senate President, Senator Ike Ekweremadu, and his family but a case of Burglary,” he said. Mr Moshood revealed that the police have commenced an investigation into the incident. According to him, Yusuf volunteered confessional statement after interrogation in which he admitted to the crime and mentioned Ali who is now at large having escaped from the scene. He said some housebreaking implements were recovered from the suspects. The Force spokesman insisted that the attack was a case of burglary, although investigation was still ongoing to determine if there was any other motive behind the crime. He disclosed that the same suspects had earlier broken into another residence in the APO Legislative quarters where they stole phones, pieces of jewellery, and other valuables before proceeding to Senator Ekweremadu’s residence. Moshood said the Deputy Senate President and the other victim have made statements to the police about the two incidents. He stressed that there was no delay in police intervention in the attack on the lawmaker’s residence. He revealed further that four police personnel and one personnel of the Nigeria Security and Civil Defence Corps (NSCDC) on duty at Ekweremadu’s residence at the time of the incident have been arrested. The police spokesman said the security personnel are in detention and being investigated for negligent acts and dereliction of duty. He assured Nigerians that the police would make the outcomes of the investigation public as soon as possible.